Camanche head coach Jay Garvey poses with the Coach of the Year plaque and all the awards won by the Camanche bowling teams this season on Monday night after the bowling banquet at Imperial Lanes. 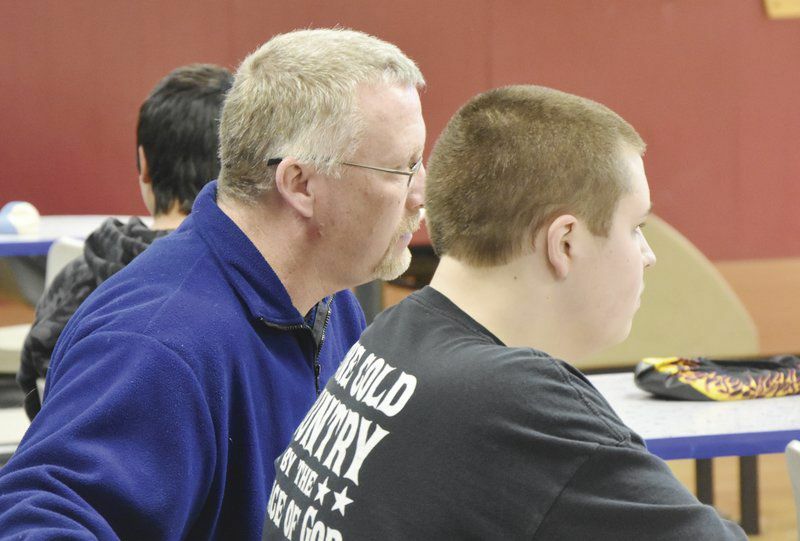 In this Clinton Herald file photo, Camanche bowling Jay Garvey (left) chats with a bowler ahead of the 2018 state tournament. Garvey was named the Class 2A Coach of the Year this season after taking both Indians teams to state. 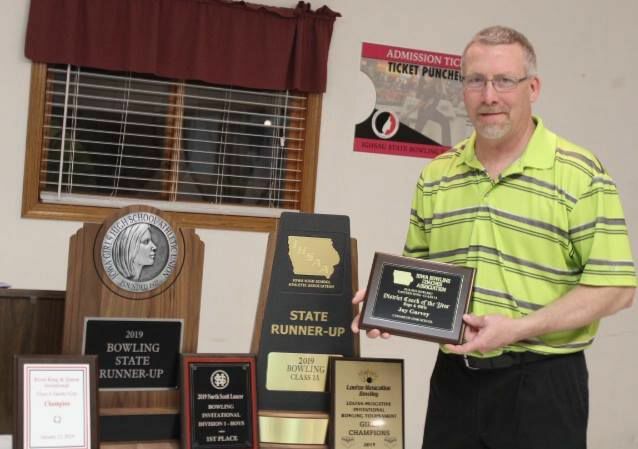 After going 2-for-2 on runner-up finishes at the 2019 State Bowling Tournament, Camanche head coach Jay Garvey received even more: the Class 2A Coach of the Year. “This is a huge deal,” Garvey said. He got to see the new hardware at the bowling banquet at Imperial Lanes on Monday night, where both teams gathered to celebrate what they accomplished this season. Both the boys and girls rolled their way to a phenomenal 2018-2019 season, although it wasn’t always a certainty. For the girls, they weren’t even sure they would have a team for a bit. On the boys’ side, it was also unclear how the roster was going to shake out. It all panned out. The Indians swept the district titles in Cedar Rapids then both finished second in the state. Garvey certainly has had a nice run with Camanche, even having a year with two state champions. A year like this isn’t taken for granted, though. Garvey, along with assistant Brad Weber, have a definite style. “A little conservative, a little laid back,” Garvey said. “We don’t yell very much. We just try to teach, do drills, make them understand situations and make their bowling mentality stronger so they understand the game. Part of that is that they have been around for a while. The consistency of their presence in the athletes’ lives has formed a connection between the coaches and the teams that help them lead. Garvey, the former owner of Imperial Lanes, and Weber have seen the kids evolve as bowlers. With all his accolades and successes on the state level, Garvey still takes a simple pleasure out of being the coach of the Indians. He enjoys seeing the bowlers grow as athletes and get to experience years like this. They are state runner-ups, and that is something they will not forget. WATERLOO – The Camanche bowling program did not disappoint on the grand stage Monday afternoon.